The Giganotosaurus and Tyrannosaurus (T. Rex) lived millions of years apart and in different areas. The long-skulled Giganotosaurus, native to South America, lived during the Mesozoic Era (97 million years ago), while the massive, heavy-headed T. Rex, native to North America, lived during the Maastrichtian age of the upper Cretaceous Period (67 to 65.5 million years ago). 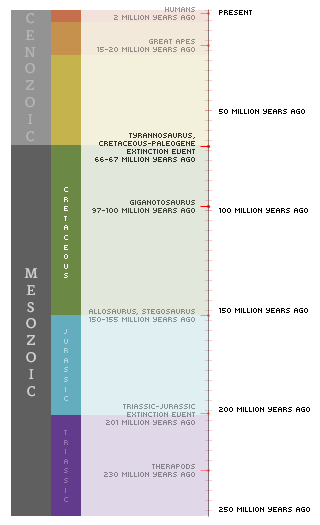 Both these extinct giants were carnivorous and gigantic compared to other dinosaurs. The T. Rex was one of the more aggressive and dangerous dinosaurs, and although the Giganotosaurus lived in a different time, it is said to have come closest to being as powerful. Biped; walked on two large, powerful back legs; fairly agile; could travel up to 31 km per hour. Bipedal powerful tail allowed it to move quickly; could run up to 25 kmph. Typical walking speed of about 5 mph. Its legs were extremely big and powerful. Carnivorous; preyed on giant titanosaurs, other predators, other Giganotosauruses. Carnivorous; preyed on armored herbivorous dinosaurs, other T. Rex, scavenged. July 1993 discovery – first skeleton 70% complete. Partial skeleton found in 1902. More than 30 partial Tyrannosaurus specimens have been found since. Over 30 specimens exist. 1993 Teeth from what is now documented as a Tyrannosaurus rex were found in 1874 by Arthur Lakes near Golden, Colorado. Giganotosaurus (/ˌdʒaɪɡəˌnoʊtəˈsɔrəs/ jy-gə--noh-tə-sor-əs or gig-ə-not-o-saw-rus meaning "giant southern lizard") is a giant carcharodontosaurid theropod that may have been most dangerous dinosaur to have existed. Tyrannosaurus is a genus of coelurosaurian theropod dinosaur. T. rex, is one of the most well-represented of the large theropods. Tyrannosaurus lived throughout western North America, on what was then an island continent known as Laramidia. Larger than adult humans;1.9 meters long; relatively small brain; long skull; back of the skull had a steep forward incline, giant teeth. Narrow face with eyes on side of head. Heavy, thick skull; mouth full of serrated round teeth. Large brain (dinosaur standards) Extremely wide with front facing eyes giving it binocular vison. Both the Giganotosaurus and the T. Rex were huge theropods, i.e., dinosaurs that walked on two legs. The Giganotosaurus grew to be between 40 to 46 feet long and 23 feet high at the shoulder. It weighed eight tons. It had two short, powerful arms. The T. Rex grew to be 40 feet long and 15 to 20 feet high at the shoulder. It weighed between six and nine tons. In the following documentary, Beyond T. Rex, paleontologists compare the size and characteristics of these two creatures and discuss whether they were carnivores or scavengers. The Giganotosaurus had a long skull which was larger than most adult humans, with a relatively small brain. The back of the skull had a steep forward incline. The T. Rex had a massive, thick skull. The Giganotosaurus stood on two large and very powerful back legs. It had three-fingered "hands" that ended in sharp claws. Its tail was thin and pointed and helped it with agility. The T. Rex also stood on two muscular back-legs. It had two puny arms that didn't even reach its mouth, and ended in two-fingered "hands." Its tail was powerful and pointed, helping the T. Rex balance its massive head. Giganotosaurus teeth were eight inches long, sharp, short and narrow with serrated edges. The T. Rex's teeth were serrated, conical and continually being replaced. Both these species of dinosaurs walked on two large, powerful back legs. The Giganotosaurus was fairly agile for its size, thanks to its tail that made navigation easier. It could travel up to 31 mph. The T. Rex had a thick tail that helped it move quickly as well as balance its massive head. This was useful since its main mode of hunting was crushing prey with its powerful jaws. The T. Rex could run up to 15 mph. The Giganotosaurus and T. Rex were both carnivores that preyed on large herbivore dinosaurs. The T. Rex would sometimes fight each other for food, and the winner would eat the loser. In addition, T. Rex also scavenged for food. The Giganotosaurus was native to South America. It lived in forests where its prey, herbivorous dinosaurs, could find their food. 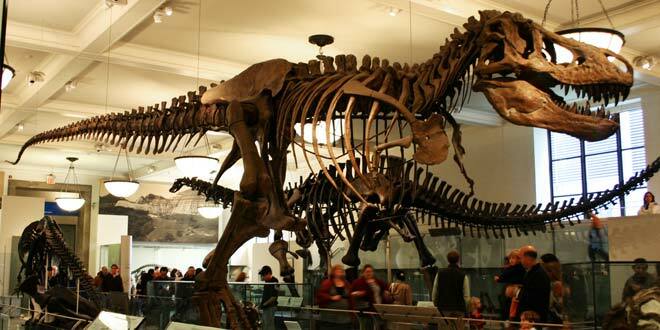 T. Rex was native to North America and modern-day Mongolia. It also lived in forests where herbivorous dinosaurs found their food. The Giganotosaurus lived during the the early Cenomanian age of the Late Cretaceous Period, around 97 million years ago. The T. Rex lived during the Maastrichtian age of the upper Cretaceous Period, 67 to 66 million years ago. Less is known about the Giganotosaurus than about the T. Rex. The first Giganotosaurus fossils weren't even discovered until July 1993. Rubén Dario Carolini, an amateur dinosaur fossil enthusiast, discovered a skeleton that was 70 percent complete in Patagonia, Southern Argentina. No complete skeletons have ever been discovered. A lot is known about the T. Rex. Barnum Brown, an assistant curator at the American Museum of Natural History, found a partial skeleton in Montana in 1902. Over the years Brown found five partial skeletons. 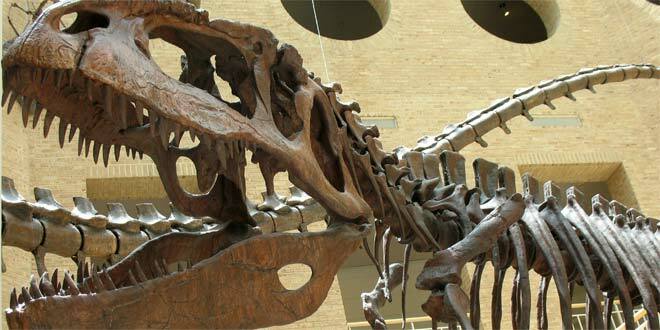 To date, over thirty T. Rex specimens exist, including a T. Rex track found in New Mexico.